We will continue our group workshops focused on audio production and sound design using Ableton Live, Native Instruments Maschine, and NI Komplete. The dates and frequency of these workshops depends on demand — specific workshop dates will be announced throughout the year. Need personalized instruction targeting your needs? Check out our individually tailored one-to-one courses. 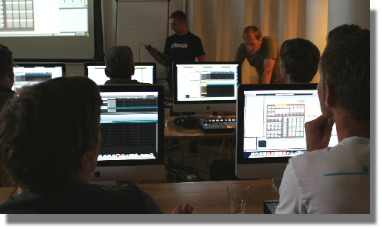 big brain audio offers intensive weekend workshops in small groups as well as one-to-one instruction on Ableton Live and Native Instruments products. We are a Berlin-based Ableton Certified Training Center, with a pool of the most highly-qualified instructors in the field, headed up by Ableton Certified Trainer Brian Smith. Our aim is to make you the master of your audio production environment. Unleash your musical creativity with big brain audio! Find out more about big brain audio here. Our workstations are outfitted with the Push 2 and Ableton Live (Suite), as well as the Native Instruments Komplete bundle of instruments and effects. Keep informed with the big brain audio newsletter. Check our “Introduction to Kontour” video tutorials! 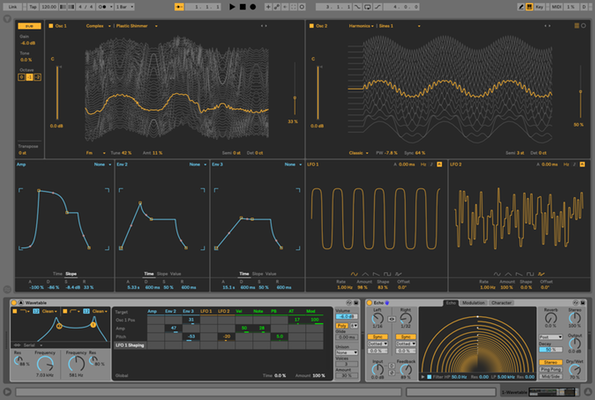 We produced nearly an hour of step-by-step walkthroughs covering the main aspects of this outstanding new Reaktor-based synthesizer created by Stephan Schmitt. Go to our dedicated Kontour page or watch them on the big brain audio YouTube channel. You can also watch all five videos in a playlist. Our workshops go deep. With small classes and expert teachers, we make sure you learn. And create. With full-on, all-day intensive training, our weekend workshops will turbocharge your productivity. The courses are based on step-by-step hands-on learning, ensuring the best possible learning environment. We focus on the best tools in the industry — made by Ableton and Native Instruments — with the highly-acclaimed NI Komplete bundle, including: Reaktor, Kontakt, Absynth, Massive, FM8, and Maschine,* the world’s only fully-integrated groove production and performance system. It goes without saying that Ableton Live is our sequencing, arranging, and performance production environment. We teach musicians how to get the most out of their creativity with these high-powered studio and stage instruments. Take a one or two day weekend course to sharpen your audio skills on the best software and hardware tools available today. With a course maximum of twelve participants (six for one-teacher courses), you will work on your own workstation with an iMac computer, a keyboard-controller (a Maschine controller for the Maschine workshops or a Push controller for the Ableton Live workshops), audio interface, and headphones. Our workshops have become popular through a combination of the best possible teaching environment and world-class instructors with a laid-back community experience. Check out the upcoming workshops. To get an idea of what a big brain audio workshop is like, check out the articles from the blog here, here and here. If you have any questions, check out our faq page or drop us a line.